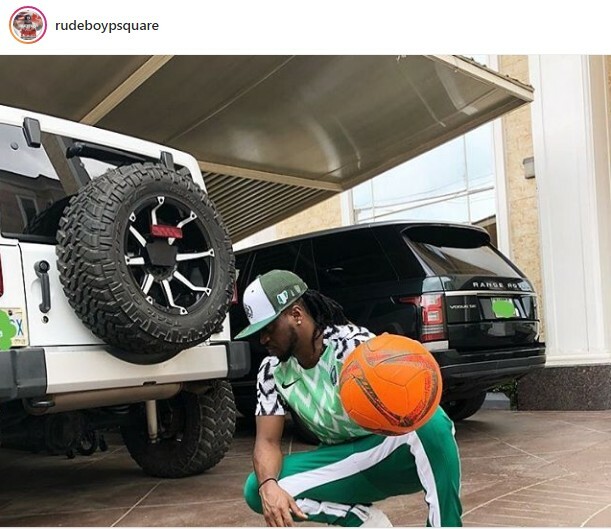 Singer, Paul Okoye like every other Nigerian is also anticipating Today’s Match, but he’s not happy with what the country has turned into, Sharing a photo on his page minutes ago the father and Husband has advised Nigerians to Pour out their mind and cry out even if the super eagles win today. 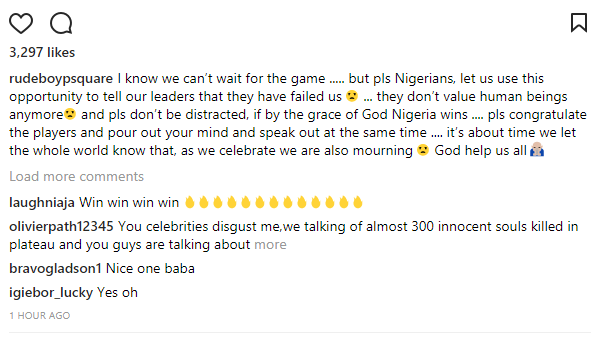 Meanwhile, Nollywood actor, Yomi Fash-Lanso who went all out to campaign for President Buhari in 2015,has written an open letter to the President following the killings and bloodletting in different parts of the country. I would’ve loved to write you a letter but I know you won’t get it even if it’s through DHL, UPS, FEDEX etc cetera, thus my reason of putting it up here on my page, and tagging you because I know that via this medium you’ll get it, or your page handlers will pass the message to you. I’m a born and bred in Nigeria man. Lagos state to be precise, and I’ve lived all my life in this beautiful country because I LOVE my country. Not because I can’t afford to CHECK OUT with my family. So you’ll understand my STAND. I followed you from 1984 – 2015 because of your INTEGRITY, ANTI CORRUPTION CAMPAIGN, TENACIOUS STAND and your ONE NIGERIA advocacy you’ve always preached. Mr President I was one amongst millions of young Nigerians that put their LIFE, CAREER and FAMILY on the line to campaign for you when you showed interest in Nigeria politics because WE believe you can put Nigeria back on the RIGHT PATH, and we were so happy when you eventually won in 2015. Some even lost their precious lives celebrating your victory. But! What went wrong SIR? Sir, are you still in CONTROL of SECURITY and SAFETY of LIVES and PROPERTY in Nigeria? Sir, are you now TRIBALISTIC as been alleged by some quarters in Nigeria? Sir, are you carrying out a FULANI AGENDA as been alleged by some quarters in Nigeria? Sir, are the lives lost – been BRUTALLY and MERCILESSLY SLAUGHTERED since 2015 not Nigerians? Sir, are you so sure that some POLITICIANS are the ones BEHIND the mishaps befalling Nigeria? Sir, are the Miyetti Allah people that own up to the plateau, benue and other state killings ABOVE THE LAW? Sir, is life of a COW worth more than that of a HUMAN? Sir, is it a norm that farmers crops and vegetations which are source of SURVIVAL for them be DESTROYED because COW REARERS need to GRAZE the LAND? Sir, are you accepting the fact that COW REARERS are KILLERS in disguise? I’ll stop here sir while I and millions of Nigerians that CAMPAIGED and VOTED for you wait for answers via ACTIONS. 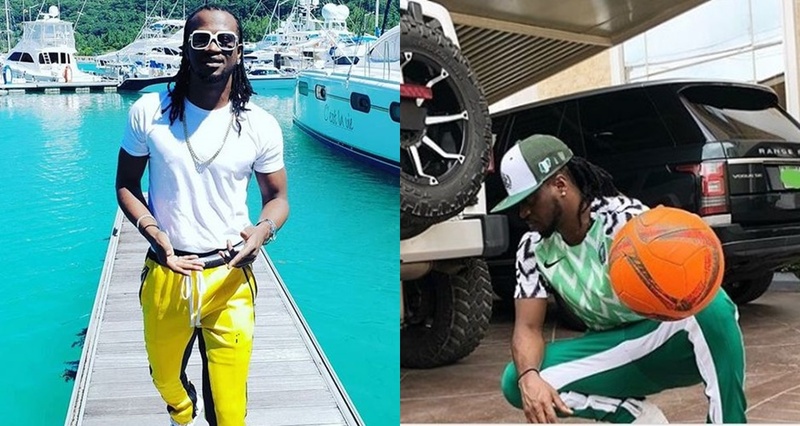 0 Response to "Paul Okoye Tells Nigerians To Talk About Herdsmen Killings Even If Super Eagles Wins Argentina"